Barack Obama has accepted the Democratic Party's historic nomination to run for president of the US in front of a crowd of some 75,000 people. In an address at the party's national convention in Denver, he promised he would do his best to keep alive the American dream of opportunity for all. "America, we are better than these last eight years," he told cheering crowds. "We are a better country than this." Mr Obama is the first African-American to be nominated by a major US party. In his speech at Denver's Invesco stadium, Mr Obama promised to reverse the economic downturn afflicting the US and restore the nation's standing in the world. "We are here because we love this country too much to let the next four years look just like the last eight years," he said. He also attacked the record of the Bush administration and his Republican rival for the presidency, John McCain. "This moment - this election - is our chance to keep, in the 21st Century, the American promise alive." Mr Obama criticised Mr McCain as out of touch with the concerns of ordinary Americans and said he had failed to help them on issues such as the economy, health care and education. He also stressed that he would call for the withdrawal of troops from Iraq, whereas Mr McCain stood "alone in his stubborn refusal to end a misguided war", he said. He rejected criticism by the McCain campaign that he is a "celebrity", pointing to his family's past financial hardships, and said his rival should stop questioning his patriotism. In a final rallying call, Mr Obama recalled the message of Martin Luther King, who - 45 years ago to the day - gave his "I have a dream" speech in his historic march on Washington. "America, we cannot turn back," he said. "We cannot walk alone. At this moment, in this election, we must pledge once more to walk into the future." Joined on stage by his family and running-mate, Joe Biden, Mr Obama was given a standing ovation by the crowds. Earlier in the day, Mr McCain ran a TV advert in which he congratulated Mr Obama on the historic nature - and date - of his nomination, saying it was "truly a good day for America". The political truce was short-lived, however, with a spokesman for the McCain campaign issuing a statement following Mr Obama's address that dismissed his words as "misleading". "Tonight, Americans witnessed a misleading speech that was so fundamentally at odds with the meagre record of Barack Obama," spokesman Tucker Bounds said. "The fact remains, Barack Obama is still not ready to be president." 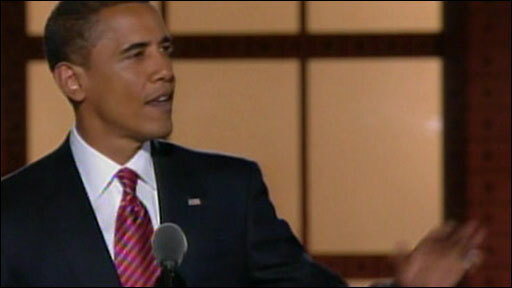 The BBC's Justin Webb in Denver says that this needed to be a serious speech by Mr Obama and it was. One feature was that Mr Obama made frequent reference to the future, our correspondent says. The Obama camp knows that Americans are worried about Mr McCain's age and ever so subtly they are making an allusion to it. Martin Luther King's eldest son, Martin Luther King III, had earlier told the convention that his father's dream lived on in Mr Obama's candidacy. "He is in the hopes and dreams, the competence and courage, the rightness and readiness of Barack Obama." 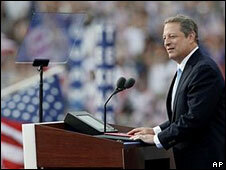 Former Vice-President Al Gore also called on the Democrats to "seize this opportunity for change" and elect Mr Obama. Linking Mr McCain firmly to the policies of President George W Bush, Mr Gore said it was vital that Americans changed course if they wanted to tackle a "self-inflicted economic crisis", protect the rights of every American and halt global warming. Mr Gore added that the US was "facing a planetary emergency" and that the ties of Mr McCain and the Republicans to big oil firms meant they would not act to end the country's reliance on fossil fuels. Mr Gore's address, warmly received by the crowd, followed performances from singers Stevie Wonder, Sheryl Crow and John Legend. The Obama campaign took the unusual move of holding the closing night speeches in the sports stadium to allow ordinary voters, as well as party delegates, to attend. Mr Obama's much-anticipated appearance was the highlight of the party's carefully choreographed four-day event. Questions remain as to whether Mr Obama can cement his standing within his own party, and reach out to those parts of the electorate that are yet to be convinced by him, the BBC's Matthew Price in Denver notes. He was resoundingly endorsed by ex-President Bill Clinton on Wednesday, which may help consolidate his standing. Earlier that same day, in a moment of high drama, his defeated rival Hillary Clinton cut short a roll-call vote to endorse Mr Obama's candidacy by acclamation, in a powerful gesture of unity. The presidential election on 4 November will pit Mr Obama against Mr McCain, who will be nominated next week at his party's convention in St Paul, Minnesota. Republican officials say Mr McCain has chosen his running-mate, but the person's identity has not yet been announced. Mr McCain is due to hold a 10,000-strong rally in the swing state of Ohio on Friday, at which it was expected he would present his vice-presidential candidate.